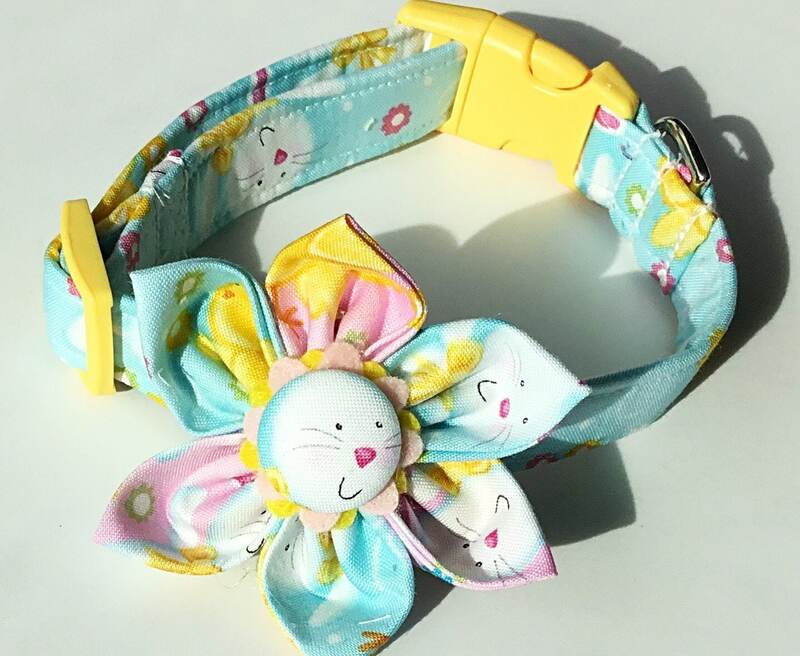 This pretty Easter Bunny Flower and Collar is perfect for your girl dog or cat at Easter. The Easter Collar features a light blue background with white bunnies and yellow chicks throughout. I have used this same fabric on three of the petals of the mathching Easter Flower while the other 3 petals were made from the same Easter themed fabric except in the color of pink. I have added a pink and yellow floral felt motif to the center and a fabric covered button sits within the center with a bunny’s face forefront and center. (Note: Center decorations may vary according to stock availability and size of flower.) Yellow collar hardware was used on this collar. The flower attaches to the collar by way of wraparound velcro which has been added to the back of the flower. The velcro is additionally supported by felt which provides longer lasting strength and durability of the flower.